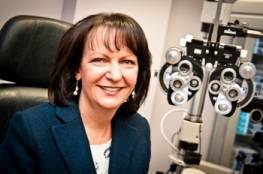 It’s hard to believe that it has been over 34 years since I started my career as an Optometrist in Brantford and Paris by joining the practice of Nisker, Madill and Associates, started by Harold Nisker in 1950. I was immediately welcomed by the Doctors, staff and most importantly, the patients. Many changes have occurred over the years, including new Brantford and Paris locations, new Doctors, new team members and new names of Brant Family Eye Care and Paris Family Eye Care. As the community has grown, so has the practice, introducing new equipment, technologies, products and ideas. However, the one thing that has stayed the same is the philosophy that patient care comes first. Over the years I have had the opportunity to meet and provide vision care to many amazing and wonderful people – some for only a short time but some for over 34 years. I have had the pleasure of seeing the children of people who were children when I first saw them and in some cases I see 4 generations within a family. I have enjoyed getting to know people and have had many wonderful conversations about children, grandchildren, vacations (especially cruises), gardening, Sauble Beach and most recently Costa Rica. Another popular conversation recently has been retirement and I have repeatedly seen the big smiles of retired people, especially my husband who retired a year ago. For this reason, I have decided to follow in his footsteps and retire at the end of December 2018. We are excited about the next phase of our lives which will include more travel, winters spent in Costa Rica and the upcoming weddings of both of our sons to their wonderful fiancées. I am also looking forward to the opportunity to pursue hobbies and interests that I currently do not have time for. It has been an honour and privilege to get to know each of you and I thank you for allowing me the opportunity to look after your visual needs over the years. Although I will certainly miss seeing everyone, I am leaving knowing that you will continue to receive the same quality of care from the Doctors at Brant/Paris Family Eye Care that I worked hard to provide over the years. They will strive to make the transition seamless and I encourage you to continue to show your loyalty to Brant /Paris Family Eye Care and your new Optometrist. I wish you all good health and happiness and again my sincere thanks for 34 wonderful years.